Some offences don’t bring points, such as driving a car with no MOT or driving without using your seatbelt. How many points will I get? How many penalty points you get depends on the offence and in some cases, how serious the offence is. See our Offence Guides for further details. How many penalty points do I have? If you’d like to check directly with DVLA how many points you have. See the Penalty Points Checker. If you face a totting up ban, you may have a case for Exceptional Hardship. Call us to discuss your case. A single speeding offence could see you “totted up” and banned. What is the significance of Penalty Points on my licence? Once you have totted up twelve points on your licence, you will get a “totting up disqualification” (a driving ban) for 6 months. If you are a “New Driver”, is you have passed your driving test within the last two years, then your licence will be “revoked” by DVLA once you have 6 penalty points or more. You will be required to sit your driving test again and reapply for your licence. Points on your licence must be reported to your insurer, and they might affect the cost of insurance. 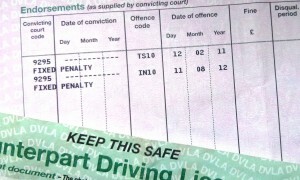 Penalty points are placed on your driving licence, but also recorded by DVLA on an electronic database. There are different offence codes for each offence. It is important that your paper driving licence reflects the electronic record. If it doesn’t, DVLA will write to you (usually) and may revoke your licence if they do not receive it. If you are concerned that your driving licence doesn’t reflect accurately what DVLA might have recorded, we can assist with this.